If you are looking for a stylish?sling bag then this red coloured one from Lavie will be the right choice for you. Made from synthetic leather,Final- this sling bag is durable and will be easy to carry as it has a comfortable shoulder strap. You can keep your make-up?and cash in it with ease.? Carry it with a trendy dress at the next party to look?best among the people present there. 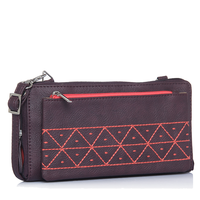 If you are looking for a stylish?sling bag then this red coloured one from Lavie will be the right choice for you. Made from synthetic leather,Final- this sling bag is durable and will be easy to carry as it has a comfortable shoulder strap. You can keep your make-up?and cash in it with ease.? Carry it with a trendy dress at the next party to look?best among the people present there.